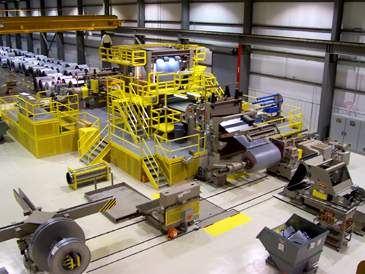 Madison, MS - Mi-Tech Steel has installed a state-of-the-art "Double-Loop" surface inspection/slitting line in its Madison, MS coil processing facility near Jackson, MS. 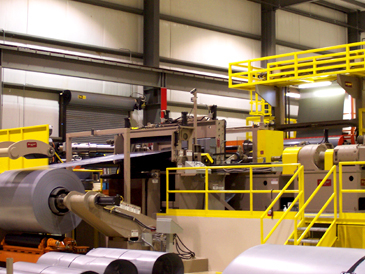 The line is designed to process 60,000# x 74" wide exposed automotive quality cold rolled and coated coil in gauges from .015" through .125" at processing speeds to 1,000 FPM. Coils can be unwound from top or bottom in either pull-off or "loop" modes, surface inspected top side and bottom side, side trimmed or slit, and rewound either from the top or bottom with a Top/Bottom Belt Wrapper attaching the strip to the Recoiler mandrel. Coil Staging & Loading: Master coils are staged ahead of the line on non-marking Storage Saddles. A unique Coil Car retrieves, transports, and loads the coils onto the Uncoiler. 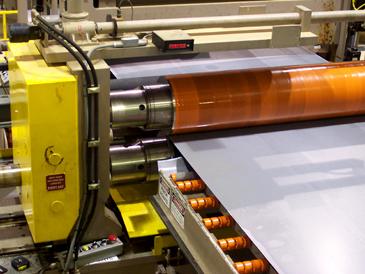 Driven "blocker rolls" on the Car rotate the coil for convenient OD band removal prior to loading while an electronic scale records the coil weight. Imperfect inside coil wraps are cropped off the coil and rewound back onto the Uncoiler. The Coil Car quickly removes the ID pup coils from the Uncoiler drum and unloads the scrapped material onto a storage ramp while traveling to retrieve the next master coil. 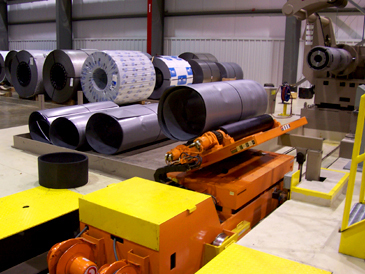 Uncoiling: The Mi-Tech Uncoiler operates in a "pull-off" tight strip mode and a "free-loop" mode, and is capable of top unwinding and bottom unwinding depending upon the coil processing job. A 250 HP-DC motor provides the forward "loop-control" power for the free-loop operation, and provides enormous back tension during a tight-line pull-off operation. A floor mounted Outboard Support eliminates shaft deflection and vibration in all operating modes. Pushbutton Tooling Lock-Up Turret Head Slitter™: Side trimming and precision multi-cut slitting is accomplished by a quick-change 150 HP x 9.000" Turret Head™ Slitter with 3-heads. Slitter re-tooling time is reduced with a pushbutton hydraulic tooling lock-up system that locks shimless slitter tooling onto the arbors without threaded lock nuts or grease guns. The slitter can be operated in a driven loop mode for multi-cut slitting or drive-assist mode for side-trimming.